Could Josh Moore’s ‘Chopped’ victory win me to TV food competition? Outside of “Iron Chef,” I’ve never liked TV head-to-head chef competitions much. Such shows are commonly contrived events made barely interesting with ridiculous challenges, hyper-vocal commentators, absurd time constraints and mystery baskets of “who the hell eats these?” ingredients. 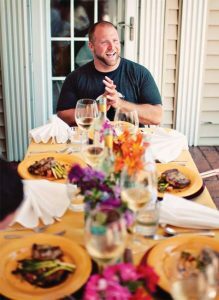 And when it was announced that Volare Italian Restaurant executive chef and partner Josh Moore would be on “Chopped,” I still wasn’t planning on watching it. That I didn’t even care to watch an admired chef and industry friend subject himself to what I expected to be 30 minutes of Hollywood un-reality cooking shows how little I like such shows. But as of last night, I backpedaled and watched it and actually enjoyed it. A lot. Far more than I expected. And to be honest, I watched it at my wife’s insistence. She wanted to see the local boy perform on a serious stage. So there you have it, Josh, Leslie made me do it. Save the hugs for her and the “Really, man, you weren’t going to watch?” abuse for me. I’m truly glad she insisted. But mostly I liked seeing the skills on display. Among the four chefs, there were no slackers in that bunch. No pre-midlife-crisis-I-want-a-new-career-wannabe chefs that find their way onto the “Top Chef” roster because of camera-ready looks or an ability to stir the tension pot. These people were pros with solid cooking skills and incredible creativity under pressure. Which is how Josh Moore won. Creativity under pressure. SPOILER ALERT: If you’ve not seen the episode, Moore uses the raw sea urchin in his mystery basket to make an ice cream. That’s right, uni ice cream, which sounds nothing like an upcoming Ben & Jerry’s flavor. That it so impressed the judges likely tipped the scales in Josh’s favor, because the contest was close up to that point. Though calm throughout the contest, at no time did Josh get cocky or display any overt confidence that he was going to win. Instead, the knowledge that he was well matched was etched into his expression throughout the show. Having watched my first episode of “Chopped,” I’ll say it’s the least contrived of the un-reality cooking shows–at least the ones I’ve dared watch. (I’ve heard the “Great British Bake Off” is good.) It never got goofy save for some weird ingredients (a prebaked “Ace of Cakes” castoff blue wave cake) and the aforementioned sea urchin–both of which had to be used in a dessert. The judging, done by real restaurant pros, not runway models or journo-columnists of dubious qualifications, was straightforward, largely objective, believable and done mostly without the snide remarks that make for next day watercooler “ooh, burn!” discussions. It was suitably professional. And that’s what I like: something believable, which Hollywood has little interest in delivering, and I have little interest in watching. Regardless, I’m glad my guy won. Congratulations, Josh Moore! You did it! Now go build Lindsay that bathroom.